Using the DL850, the waveform data was directly saved as an ASCII file in the *.CSV and *.WDF file format (NOT an Xviewer conversion). The sample files that have been provided contain the same waveform data, which is a total of 300,300 data points. The ‘Trigger Time’ displayed in Xviewer using *.WDF header and the 'Time' row in Excel using the *.CSV file, represents the trigger time. The trigger time is shown at the center of the main acquisition window in Xviewer, and lies between two points. The trigger level was set to 0 volts exactly using narrow hysterisis. Within Xviewer the trigger's default position is located at the midpoint. This means that for even numbered data points, such as 300,300 in the sample file, the exact midpoint cannot be determined. 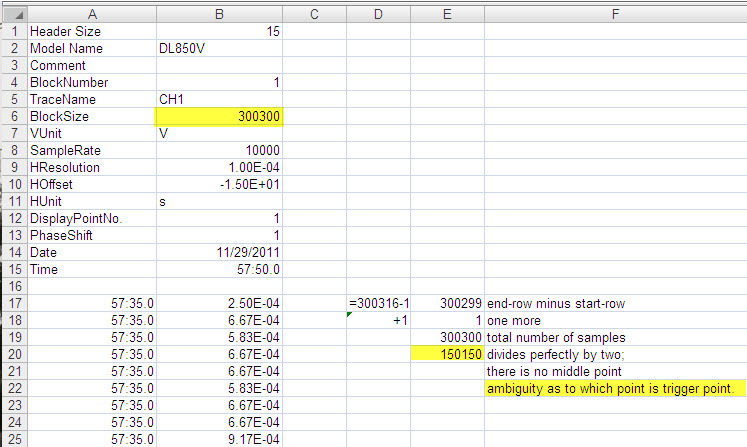 Dividing the 300,300 data points in half, the midpoint lies between two points. The theoretical midpoint (trigger position) in Xviewer should be between: Sample No. 150,149 and 150,150. However, when the cursors are placed at Sample No. 150,149 and 150,150, the voltage level does not measure 0. In fact, the trigger has already occurred at a previous point. This offset in Xviewer is caused by narrow hysteresis set by the DL850. As another example, in the *.CSV file the 0 volt trigger occurs at row #149,480 and should be at Sample No. 149,464 in Xviewer. However, when you place the cursor at Sample No. 149,464 in Xviewer, the measurement reads 583.33 uV. 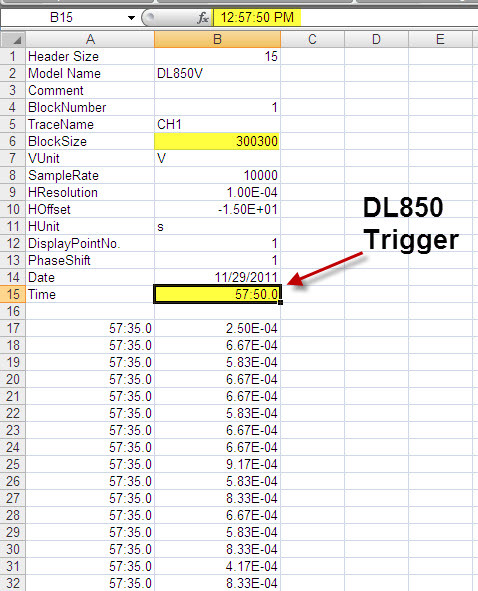 The actual 0 volt trigger in Xviewer occurs at Sample No. 149463. The trigger time is horizontally offset from the trigger-level due to the hysteresis offset and all DL scope products exhibit this effect.